The Vollrath 67810 Wear-Ever® frying pan has an aluminum body that quickly heats up. To prevent burns, the handle is covered with silicone. Food easily comes out with the three-layer, non-stick coating. This dish is safe to use in ovens, as well as on stovetops. It can be used continuously in temperatures as high as 450 degrees Fahrenheit. 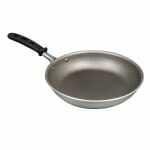 Additional information on aluminum pans is available in the cookware buyers' guide.